Being a major video game series, Zelda has a lot of fan artwork and fiction created by its large fanbase, but every once in a while you see something really fantastic like this, which you can view here (thanks go to the guys at Zelda Chronicles for finding this first). 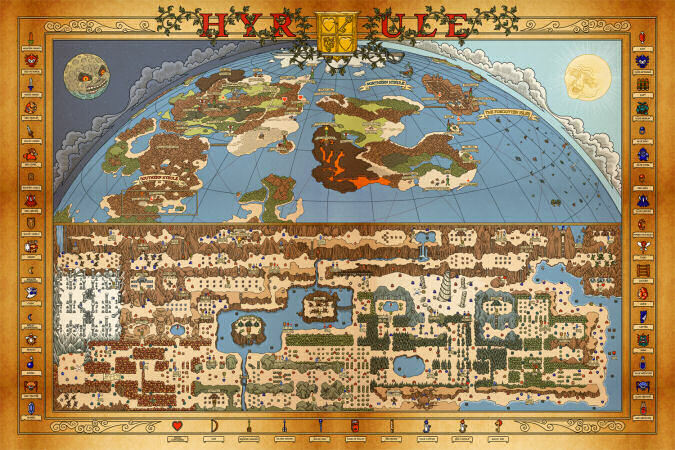 This is an amazing piece of artwork illustrating an authentic map for the overworlds of both the original Legend of Zelda and its sequel Adventure of Link. It’s incredibly detailed, even listing out the locations of items, dungeons and secrets, so it also functions as a quick guide. It even lists items and enemies from the original game along the edges. The artist is actually selling prints of this picture, which make great posters. You can check it out here. I think this piece of artwork is great. The artist really added all the details, making it comprehensive. And it really feels like an actual map from the kind of time period we see in Zelda. Do you think it’s cool? If you’re a fan of the original Zelda games, do you think it’s accurate and authentic? If you’re not a fan of the originals, do you still think it’s interesting? Tell us below in the comments!